During December, homes and bakeries in Switzerland are filled with the aroma of classic cookies like these "Zimtsterne." In a large bowl, cream butter and sugar until light and fluffy. Beat in eggs and chocolate. Combine flour and cinnamon; gradually add to creamed mixture and mix well. Wrap dough in plastic wrap; refrigerate for 1 hour or until easy to handle. On a lightly floured surface, roll out dough to 1/4-in. thickness. Cut with a floured 2-in. 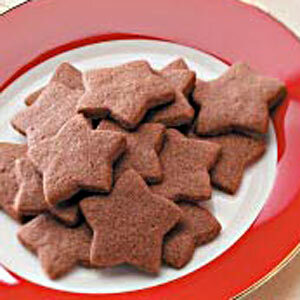 star-shaped cookie cutter. Place 1 in. apart on ungreased baking sheets. Chill and reroll scraps if desired. Bake at 350° for 9-11 minutes or until edges are firm. Remove to wire racks. Yield: about 5 dozen.